2017 in running was phenomenal (read: Highlights of 2017). I dealt with some of my deepest insecurities and fears while also surprising myself with incredible milestones. For 2018, I want to keep the momentum going and continue to challenge myself. Last year, I kicked off the new year with a piece on my running goals of 2017. I think it makes sense to do this again so here we go. After completing the TCS New York City Marathon, I decided to do it again this year with a mean vengeance. (Also because I didn’t get accepted into any other marathon.) Attempting to finish a marathon in under four hours is a moonshot that terrifies me. I’m barely at 1:55:24 with my half marathon PR so it’ll be a stretch to finish a full in less than four hours. But I’m with the right team that will help get me there and it gives me a big goal to chase. The B.A.A. Distance Medley series consists of a 5K during marathon weekend in April, a 10K in June and a half marathon in October. It will be my first time traveling outside of New York City for running and I’m looking forward to this! Being part of the Boston Marathon festivities will certainly be inspiring and give me the fuel to work hard to earn that BQ, even if it takes me twenty years. In 2017, I aimed to run an annual total of 1,000 miles and I did it! This year, I want to average around 4 miles per day (but not run 4 miles every day) so that would approximately total to 1,500 miles for the year. It’s definitely a big bump up from last year but a doable challenge. It’s wild to think about how far 1,500 miles could take me – I could potentially go halfway across the country on foot! My current half marathon PR is 1:55:24 from the Airbnb Brooklyn Half Marathon. This was my most well-executed race, having gotten my negative splits and fueling strategy down. My biggest regret, however, was not doing as much speed work during training. But this year, that’s all about to change. Now that I’m with the Dashing Whippets, I’m doing speed work twice a week and taking my long runs more seriously. I’m after you, sub-1:50! Throughout the year, I took non-running fitness classes whenever I felt like it. They kept me strong and tamed my injuries so I don’t think it was terrible. But there were definitely weeks when I did too much cardio at high intensities without properly doing strength work and my running suffered. The goal with strength work is to supplement my running so I’m going to be more intentional about what I do. I love running but sometimes, I take the sport too seriously and begin to resent it. Training can be rigorous and I often feel the burnout so I want to avoid that for the next marathon I train for. 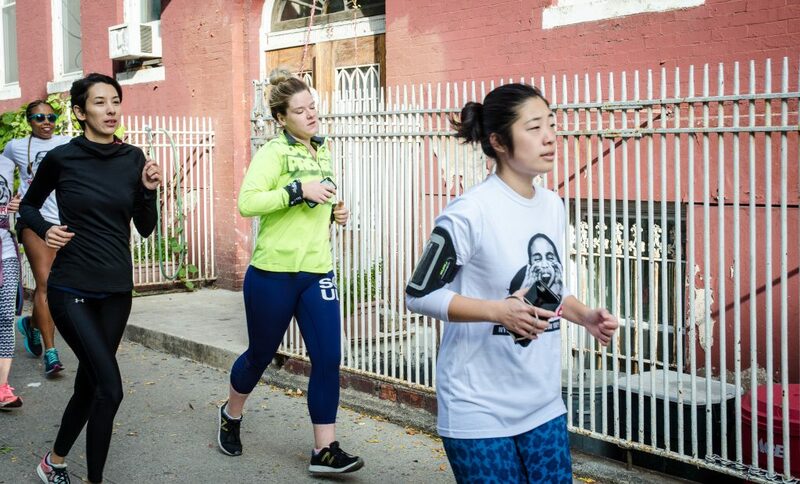 I want to find more ways to make running fun like exploring different neighborhoods and joining fun runs with groups. I don’t want to worry about the pace nor the distance. I want running to always be something that is challenging without taking away the excitement. Racing every month kept my competitive spirit high and worked extremely well for me last year. I’m set on doing it again this year. It’s an excellent way to keep myself accountable. This year, I want to be more selective about the races I do, rather than to get excited and sign up for all of them. I have my favorites through NYRR and a few others I haven’t done yet but am looking forward to trying out. Getting out of the F corral down to E was a tough challenge but now that I’m finally here, I’m ready to go after the next one! I generally do well in 5K races and my past performances in them had bumped me up to the front. I’m banking on using the upcoming Washington Heights 5K in early March to bring down my profile pace so I can be bumped up to D. I have to run it in about 23:15 or less (around an average pace of 7:30). I genuinely love to race. I love bringing myself to the starting line with other dedicated athletes and push myself to see how fast I could cover a distance. Last year, I ran a lot of solid races and perfectly executed racing strategies, including my debut NYC Marathon. I’m still working on running the tangents better to cover less distance and mentally pushing myself when I fall into pockets of tiredness. It’s going to be all about practicing! I spent too much of my time in 2017 being harsh on myself. I was tough on myself because I made amazing progress so small setback felt like massive failures. This year, I want to be more forgiving to myself when things are tough and not take the blame all the time. Ultimately it comes down to the fact that running is my way of telling my body and the universe that I’m in control of my life. I should never let running make me feel otherwise. I have so much to look forward to in 2018. The United Airlines NYC Half is debuting a brand new course. I’m glad I raced it last year and can’t wait to try this new one out. Now that I’m a Whippet, I can compete in the annual Team Championships race in August. I want to spend less time racing distances I’m not as excited about and more time putting in quality training. 2018, here I come. I’m about to start smashing these new goals!